My mom wearing the natty socks! With beautiful cords and other electronic paraphernalia in the background. I’ve knit socks before, and I’ve knit socks with this yarn before, but I’ve never been particularly excited about them and I’ve never worn them that much. 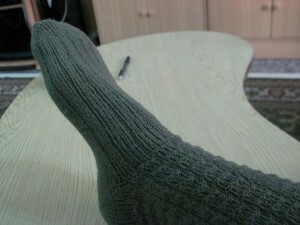 But my mom really admired my knitted socks, so I decided to make her a pair in her favorite color, green. 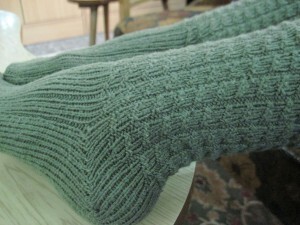 I had her pick out a pattern (she chose TATU Sock) and then I finished them in just a few months – they went really fast! As it turned out, I didn’t really use the pattern she picked out – I went by the Tern pattern instead, but I used the TATU Sock design thing on the leg, and I made some other changes to the Tern pattern, too. 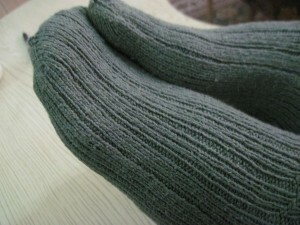 I do like this yarn – it’s nice to have a cotton yarn I can use for socks, and it’s quite soft – but it is still a bit heavy for socks, and it leaves fluffs all over my clothes while I’m using it! 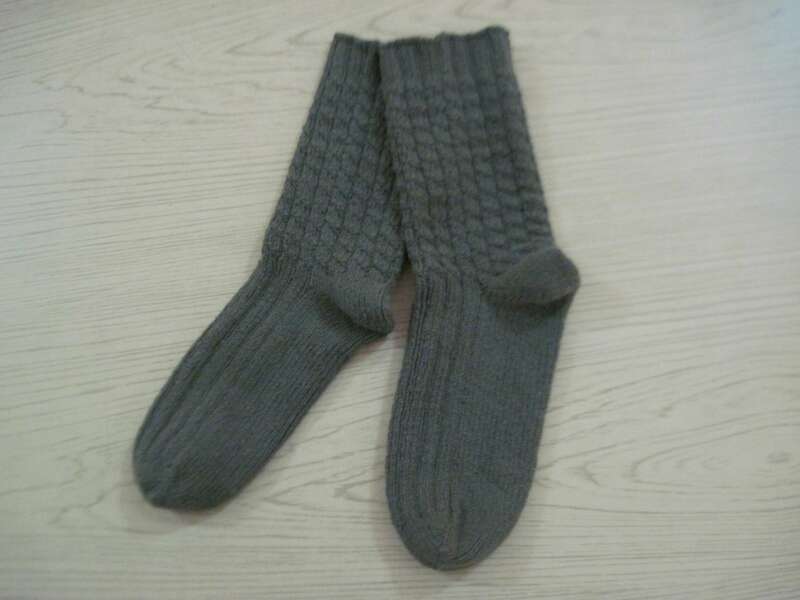 If I ever knit socks again for my mom or anybody else who’d be living in the climate I do at the moment, I’d probably use it again…but partly because it’s the only reasonably priced cotton sock yarn I could find. Note the pen sticking out of her toe. …and the top of the first sock reminds me of listening to an audiobook of The Slippery Slope, the next book in the series. I’m actually quite proud of how that heel turned out on the side, too. Certainly an improvement on my earlier socks. The second sock doesn’t remind me of anything in particular. Of course, I can’t really tell apart the two socks unless I look closely, so functionally both socks remind me of those things. My mother was rather alarmed at the name and wanted me to call them my “natty green socks,” but I can assure her that I do think they’re very natty green socks – calling them carnivorous and slippery is a compliment, since I so enjoy having memories of books wrapped up in my knitting.